To show how handy my Excel worksheet is, here’s one I did in the last 15 minutes. Apparently Sydney has had its warmest December minimum on record at 27.1 C. The record before that was Christmas Day, 1868 at 26.3C. The following seven plots show this in context. Extremes in minima can occur any time between October and March. Plainly, a new record was set this morning, but apart from Day 340 the other days are within the normal range. Extreme, but a number of previous years had warmer averages. Fig. 4: Consecutive days above 20C Tmin. But there have been longer periods of warm minima in the past. Now let’s look at the same metric, but for all of December. Fig. 5: All Decembers (including leap years). A record for December, with 1868 in second place. Seven day periods of warm nights are not new. The horizontal black line shows the average to this morning (20.6C) is matched or exceeded by a dozen other Decembers. (Of course this December isn’t half way through yet.) Also note what appears to be a step change about 1970. Fig. 7: Consecutive days above 20C Tmin in December. I doubt if 15 December will be as warm as today, but could still be over 20C. This is weather, not global warming. Was 2013 the Hottest Year on Record? Update! looks like there was a drift in UAH 2005-2006.
years is not worth repeating." That may help explain the large divergence in recent years. I will leave this post as is, with the caveat that it is based on available UAH and Acorn data. On Friday, 2 January, the BOM released its Climate Statement claiming 2013 as the hottest year on record. The UAH dataset for lower troposphere temperatures has also been just released. 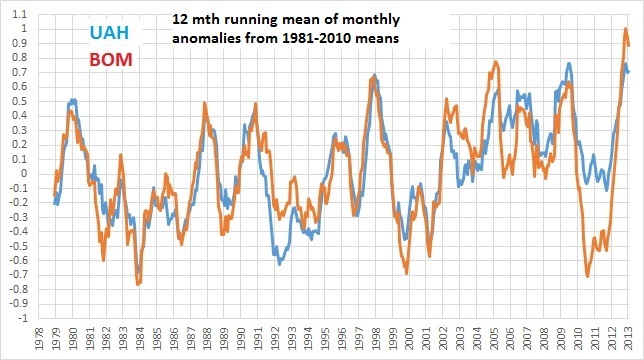 I have compared BOM monthly data with UAH by converting the BOM anomalies to the same reference period as UAH (1981-2010). It is plain to see that in the satellite era, Australian surface temperatures (as calculated by the BOM) reached a record last year. For the 12 month periods to December, UAH agrees that 2013 was the hottest, just ahead of 1998 and 2009. According to UAH, the 12 months period to October 2013 was just edged out by the 12 months to June 2010. So, the BOM is right in saying 2013 was the hottest on their 104 year (and very much adjusted) record. While the two datasets match reasonably well in most years, especially 1996-1999, they diverge markedly in recent extreme years. It appears that the BOM area averaging algorithm accentuates extremes, probably because of the scarcity of observing sites in the remote inland, where warming and cooling are much greater. Alice Springs, for example, being hundreds of kilometres from the nearest neighbouring site, contributes 7 – 10% of the national warming signal. So- if you are interested in the weather, how hot it is locally, consult the BOM- the old Weather Bureau. If you are interested in whether the climate is changing due to greenhouses gases, consult the satellite data. And yes, the weather has been hot (and still is where I live). I’m nearly a year late with this, but I’ve only just noticed. 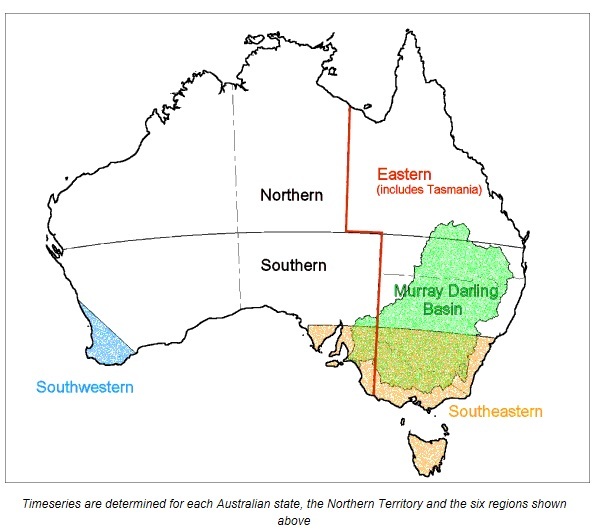 According to the Bureau of Meteorology’s official temperature records, for all of the Northern Australian region- the half of the continent north of 26 degrees South- the minimum temperatures are steadfastly refusing to rise. From 1982 to 2012, the linear trendline for minima is on the decreasing side of dead flat. This is longer than the 3o years regarded as the minimum period for analysing climate trends, and in spite of the massive increase in amount of CO2 emissions. Note that 1982 and 2011-2012 were almost equally cooler than normal. Remember that one of the fingerprints of greenhouse warming is that minima should be increasing more than maxima. Rather than a smoothly rising trend, the record is characterised by 10 to 15 year rapid rises and falls, responding to events in the Pacific and Indian Oceans. After New Year I will post about minima for other regions and Australia as a whole.